Which came first - the bike or the brush/pen? The pen... I started drawing when three or four. My first real bike was a used Cinelli that I bought at 12 with money I'd earned delivering newspapers on a battered 3-speed Phillips. 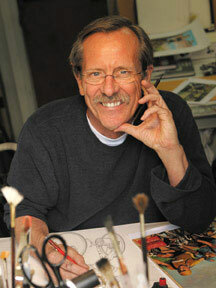 Are you a formally trained artist or self-taught? Self-taught, primarily. I went to art school at my local college (University of Colorado) in the late sixties and the primary directive then was to 'do your own thing'. I didn't understand why you had to pay for that, so I dropped out and got an apprenticeship as a signwriter in a local shop. Drawing, I prefer pen and India ink. Old-fashioned steel nib pens allow more freedom, as they are flexible, giving a less mechanical feel to the line. I pretty much painted myself sick while doing signwork, but I'm fooling around a bit with watercolour now. You'll have to excuse the ignorance of a UK based website, but I'm not familiar with any of your illustration work for Velo News. How did that happen? I met the Velo News (John Wilcockson and Felix Magowan) folks while doing some signwork for them in 1989 or so. Prior to that fateful meeting, drawing was just a hobby for me. 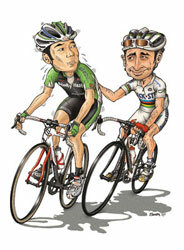 So really the first illustration I got paid for was in Velo News. What sort of format do these illustrations take - by that I mean, do you decide what you are going to illustrate, or does Velo News dictate? I typically illustrate the 'At the Back' column, which is on the last page of the magazine. It's typically an essay that speaks of life as much as it does of cycling. It's done by submission, so the authorship changes each issue. Some humorous, some serious. I get the article by e-mail, read it, let it ferment a day or two, and usually the idea for the illustration just comes to me. On occasion, when it doesn't, I'll give the author or the editor a call for a little help. The drawings are done with quill pen and ink on bristol board, then coloured in Photoshop. Do you rather delight in these extremes of technology? Now that's an astute question! And yes, it's great fun mixing old school and new. I've always loved doing that, even back in my signwriting days. Also, it breaks the task of illustration up into two distinct phases. The drawing part is challenging but rewarding when it works. I really enjoy inking my finished pencil 'roughs.' Colouring in Photoshop is great, as it's much faster than with watercolour or airbrushed gouache, plus it's very forgiving as you can fix mistakes so easily! Why not draw with a Wacom tablet in (Adobe) Illustrator or even in Photoshop? I do use a Wacom tablet, but rarely draw linework with it. Brush, airbrush, dodge and burn, etc. with it in Photoshop. But it's still like drawing with a bad hangover using it as a drawing tool per se... Pen and ink is the way to go. Are you highly proficient in Photoshop, or is it a 'need to know' basis. Pretty much 'need to know'. I usually figure something new out with each illustration. Still a long way to go before I consider myself a proficient user. I was Art Director at Pearl Izumi(Cycling Apparel) for 17 years, paralleling my tenure as contributing artist at Velo News. So yes, in directing hundreds of photoshoots, I'm pretty keen on photography. But as an Art Director and Photo Editor, not as the man behind the lens. Were the Heros du Velo conceived with a calendar in mind or 'simply' as a series of tributes? Pretty much had a Calendar envisioned from the get-go. Mac, but to me the computer's just a tool, so as long as it does the job, fine. 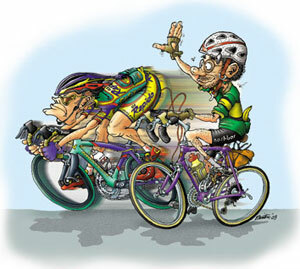 Have you been, or are you now, a competing cyclist? I've raced a bit, but never with great success. The town limit sprint or top-of-the-climb with friends is enough for me now! Perhaps unfairly, I imagine you own several lugged steel bicycles with the occasional Brooks Leather Saddle and ageing Campagnolo. True? Man, You've got me pegged! I've got a 1972 Nuovo Record equipped Frejus (see pic) A mid-90s lugged steel De Rosa, and a modern aluminum De Rosa, all of which I ride regularly. Also a '73 Merckx model Colnago (in pieces) and a mid-80s Olmo that I just built back up for my son. 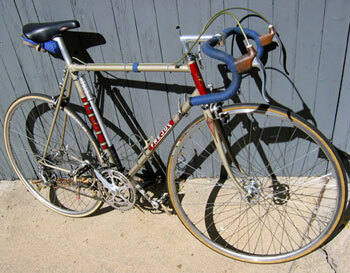 And a fendered, flat-barred Bottecchia city bike from lord knows when. I like the old stuff, but the new stuff really does work better. I took the modern aluminum Ergopower De Rosa to Italy (September 2007). What attracted you to cycling? I grew up in Northern California, an early cycling center in the U.S., and saw club riders training in the hills. Thought it looked fun. Still do. Any favourite Hero du Velo? I'm a Campy guy, but the Shimano stuff works great, too. And I rode the new SRAM gruppo the other day... Wow! Money no object, what frame/bike do you buy? De Rosa Protos (Carbon) and a custom steel Richard Sachs. Will there be a Heros du Velo 2009? 2009 will be 'The Americans', I'm thinking. Start with Major Taylor and up to Armstrong. Do you have a head-tube somewhere with the brintoni logo riveted to it? Maybe on that Sachs-to-be, eh?